What is shoulder impingement syndrome? One of the most common physical complaints is shoulder pain. Your shoulder is made up of several joints combined with tendons and muscles that allow a great range of motion in your arm. 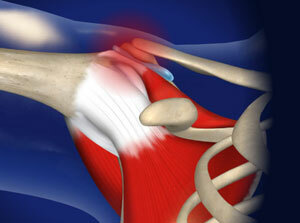 Because so many different structures make up the shoulder, it is vulnerable to many different problems. The rotator cuff is a frequent source of pain in the shoulder. This condition occurs when the tendons of the rotator cuff, along with the subacromial bursa, become compressed against a bony scapula protrusion called the acromion. 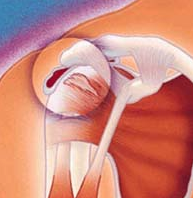 Rotator cuff pain is common in both young athletes and middle-aged people. Young athletes who use their arms overhead for swimming, baseball, and tennis are particularly vulnerable. Those who do repetitive lifting or overhead activities using the arm, such as paper hanging, construction, or painting are also susceptible. Pain may also develop as the result of a minor injury. Sometimes, it occurs with no apparent cause. Arthroscopic technique. In arthroscopy, thin surgical instruments are inserted into two or three small puncture wounds around your shoulder. Your doctor examines your shoulder through a fiberoptic scope connected to a television camera. He or she guides the small instruments using a video monitor, and removes bone and soft tissue. In most cases, the front edge of the acromion is removed along with some of the bursal tissue. Open surgical technique. In open surgery, your doctor will make a small incision in the front of your shoulder. This allows your doctor to see the acromion and rotator cuff directly. Rehabilitation. After surgery, your arm may be placed in a sling for a short period of time. This allows for early healing. As soon as your comfort allows, your doctor will remove the sling to begin exercise and use of the arm. Your doctor will provide a rehabilitation program based on your needs and the findings at surgery. This will include exercises to regain range of motion of the shoulder and strength of the arm. It typically takes 2 to 4 months to achieve complete relief of pain, but it may take up to a year.